1. Not drink coke for 80 days. 2. Weigh less than 200 pounds at some point. 3. Go on outings with each child two times during the year. 2. Less ipad/phone/movie time for the kids. I know that seems like one for them but really all of that is my responsibility. 3. Finish baby 6's Christmas stocking in time for Christmas. 2. Go shopping with Nonna. 3. Get her ears pierced "maybe." 2. Learn to ride a bike. 2. Know her ABCs and all of their sounds. 3. Go on a trip. 4. Ride on an airplane. 3. Sleep in a room with all the big kids. And just for grins, here is our resolutions from 2012. I have also added if they were achieved or not-this is where the grins come in! Happy New Year from the Dennies! Last night as we were all going to sleep in the bonus room (yes, we do have power but we like it up there) Robby and I hung up a blanket over the window. It was nighttime dark when we started stirring this morning. Robby looked at his phone and it was 8:10. That blanket will soon be hanging up tonight as well (yes, this is "no bedtime" night and we are all crashing up in the bonus room again). We kicked it into pretty high gear. First we straightened the bonus room (some), put up zillions of things that we have drug out over the past 5 no power nights, Robby worked in the kitchen and I worked with the kids in the toy room. Sometime this morning, our special child Anderson put all of the blocks down his feetie pajamas and continued to walk around the house while walking on the blocks. At least he didn't stick them down his underwear! We were no where near done when it was time to get ready. This rest will just have to be done tomorrow-fridge/freezer restocking, laundry, more picking up, vacuuming, sweeping and the official cleaning of the bonus room. For lunch, we were meeting Jacqui and her family along with the Hawkin's boys at Chick Fil A. Apparently, everyone in Bryant were also at the Chick Fil A. It was crazy, crazy, crazy but the kids still enjoyed playng on the slides. I actually think that my kids thrive on craziness! Next up we headed to Grannymom's house. She had a load of our laundry washed and folded from the power outage. The kids stayed there for a few minutes while Robby and I ran to Walmart (no cheese balls there) but we did buy lots of cleaning products. We enjoy buying things to clean with more than we enjoy the actual cleaning part. Then we went to Sams and found some cookies and the all important activity for tonight-a rice krispie treat train. I love after Christmas clearance items!! We then picked up the kids and headed home. With stops on the way at Kroger for my cheese ball (which I have not yet eaten-the kitchen is so far away from this bonus room) and a few more cookies (again Christmas clearance). Robby bought his New Year's Eve treat-a pizza and then we did head home. Keaton and Campbell fell asleep on the way home and while they were snoozing we tried to pick up a bit more. I guess it is the weather but we were tired and hungry around 4:30 so we just decided to eat early. That will sure throw the kids schedule off-hopefully in our favor since this is "no bedtime night." As we were getting ready for supper, Graham called down from the bonus room and said "Daddy, why are we eating in the kitchen?" Robby tried to explain that most people do eat their meals in the kitchen and he has just forgotten from the last few days. After we finished our supper (pizza for everyone but me, I had leftover Chinese), we started work on our rice krispie treat train. The kids were very serious about the decorating of the train tonight. They actually did better and were more into it than when we did the gingerbread houses. And this was lots, lots easier. After we made our train we headed upstairs to start the festivities. Robby had hung the sign and got out the hats and blowy things. Also he had brought the little tv upstairs so they could play Anderson's new video game up there (it doesn't work on the big new tv). First activity was playing with their toys still left up here, then they played with the video game, took customary New Year's Eve pictures, played on the ipad and phones, popping some poppers, eating our rice krispie train, an air hockey championship, shooting off more poppers, enjoying some orange juice, making some resolutions and then pottying, brushing teeth and laying out mats for movie time. It was a big night and soon we were tired-well, the kids don't seem to be tired. The plan is to watch a few movies and then hopefully everyone will fall asleep. It is now 9:30 so my guess is we will watch a few episodes of Scooby Doo and then have to put The Sound of Music on for Reagan to fall asleep. Surely that 3 hour movie will work. I will update you on the results of this "no bedtime night" in the morning. Oh and we aren't nuts, the baby did stay up a bit later (8) but then started pointing to the door wanting her milk. She was tired from tonight-her and Campbell spent most of the evening in the closet up here together. They pulled pillows in and sat on them while playing with blocks. It is so funny to watch them interact. After all of that she was ready for bedtime. I forgot to write about my Campbell from the other day. We were playing Bingo and she had a bingo. I asked her what she was supposed to say and Campbell shouted out "thank you!" Close enough for me. Well, so much for the restful nights that we had the past few nights. Night number 5 of no power was not restful at all. Keaton woke up around 12:30 and tossed and turned with me for quite awhile. We did sleep off and on until 5. It was one of those nights, when you just look out the window waiting for the sun to come up and the night to be over. At 5, Graham tried to join me but I sent him to Robby and shortly thereafter Anderson found another spot on the couch taking my pillow and blanket. Around 5, Robby did wrestle with Keaton for awhile. We did give her some more milk (she had about a gallon last night). He and I both got down in the floor with her and she did sleep for a few minutes before the sun came up. The Dennies were already up and ready when we just started stirring. They headed off to church, while the boys plus Cash and Keaton had donuts for breakfast. Robby worked on adding some gas to the generator while I dressed the kids. Then we both had showers and soon it was time to head to church. Our trash hasn't run lately so we dropped off some trash and then ran through McDonalds to pick up some more breakfast. We were a few minutes early so we had time. Then Robby dropped us off at church and parked. Our car was easy to find in the church parking lot-the only car with gas cans sitting on top. We needed more gas for the generator so he put the cans on top of the car instead of leaving them and their smell in the car. Our Sunday school class was surprisingly full this moring. I guess that everyone was ready to get out of the house. Robby worked my nursury duty for me today and I took the 3 boys to church. They were perfect through the entire thing. I did have to snap my fingers once at Graham and even moved my stuff in preparation for him to come and sit right beside me but he quickly straightened up. As church was over, Anderson stood up and asked Cash "that was long, wasn't it?" Cash agreed and added "they did too much singing." Funny boys! I think they were just ready to go and eat lunch with everyone else. We met Grannymom, Grandpa, Dana, Lilly, Campbell and Reagan at Jason's Deli for lunch. Campbell told me and Robby that she "missed us so much" and gave us big hugs. Reagan didn't really miss us as much but I think that she was still glad to see us. After lunch, we made a quick run to the gas station and then headed home. On our way home, we drove past our house down Lawson and saw 5+ power and tree trucks working on the lines. I had never seen so many lines down so we thought for sure it would at least be the next day or two before we got power. Robby turned on the little heater in our room and we put Keaton down for a nap. We are hoping that she didn't sleep well last night because she was overly tired and that a nap this afternoon would help. My nap this afternoon sure helped me. Robby didn't get his nap though. He got interested in the redbox movie he had gotten for the kids and stayed awake-even though he was all snuggled up with Campbell who was sleeping sound. About the time it was over, Grannymom and Grandpa came to move out. They gathered their belongings and then watched the rest of the movie with us before heading home. Grannymom did take a basket of my laundry with her which would leave us one load to do at her house tomorrow. We had our supper-leftover Chinese food, chicken nuggets, tacos and pecan pie. We are getting pretty good at our generator living. The generator is the best thing Robby had bought in a while. Hopefully we will not need it for a long, long time but it has certainly paid off this time-we could have survived without one but we were comfortable and that really is worth a lot. Keeping a family of 7, almost 8, comfortable is very important. Everyone had finished eating and Robby was having his fooz ball tournament with the kids, when I walked into the bathroom and the lights popped on. I started saying "hey, hey" and everyone turned and looked. Then the kids all screamed like we had won the lottery. We even all scared the poor baby. According to the entergy website, our street does not have power so we are crossing our fingers that they don't turn it off! Within minutes of having our power back on, I had started laundry and the dishes and Robby was winding up extension cords. But we are still sleeping all together in the bonus room tonight and actually, we are all going to tomorrow night as well. We have been promising the kids that they can have a stay up all night so New Year's Eve should work. Actually tonight, they went to bed around 10 and within 5 minutes everyone is sound asleep. Well, I did say that all of us are sleeping in the bonus room but that isn't quite accurate. Keaton has been banished to my bedroom. The pack n play is still up in there so Robby turned on the heater to get it warmer quicker and she was sent there to sleep. I did move the monitor so we can hear her tonight if she fusses. Back to this evening though, the topic of conversation with Reagan was getting her ears pierced. I have often told her that I would take her any time to have them done. She must be thinking about it because she sure asked a lot of questions. While the boys were taking a bath, the sensor light in the bathroom went out. They screamed that the power had gone off. Robby who was sitting behind the tv working moaned until I reminded everyone that it was just the bathroom light and quickly turned it back on. Big plans around here for tomorrow-lots of picking up and cleaning along with lunch out and then stay up all night. I am glad that power has come back on but I really kind of enjoyed it all-I guess it is nice to slow down for a bit. Cousins come to warm up & play! With us all huddled in the bonus room the last two nights, it is like we are sleeping in a hotel room and you know how much we love hotel living. The kids slept until 7:45 this morning and then snuggled with us for a few minutes. Then Anderson saw the continental breakfast sitting on the bathroom cabinet and started passing it out himself. This made everyone jump up pretty quickly! The first thing that Campbell asked this morning was "can I go get in bed with Grannymom?" and "what's that smell?" It was Grannymom and Grandpa's coffee from downstairs. They had coffee brewing in their suite along with a heater, lamp and tv. Then they came up for breakfast and the kids were thrilled to see that they actually did spend the night at our house. This little return to Little House on the Prairie living couldn't have happened at a better time: Robby is off work and we aren't trying to do school as well. Though I do feel as though I have not been able to take advantage of my first week off of school-I just may postpone our winter break another week. We are giving red box a run for their money and keeping well stocked in them. So this morning we watched another movie. I guess we should have been cleaning but that truly seems futile since we can really only do it halfway since it is too cold and too dark in the main part of the house to do it thoroughly. Or possibly those are just our excuses and we are actually enjoying lounging around, playing games with the kids and watching movies. Pops' generator arrived today so the outing was to go to his house this morning to hook it all up. Grandpa and Grannymom came with us. Grandpa helped ground it and before long, Pops had his fridge, tv and lamp working. He was most excited about having a lamp-again, it is the simple things in life. After they hooked that all up, we all had sandwiches for lunch. I must just be hungry these days but all of the food we have had during this event has really been yummy. Robby then took Grannymom and Grandpa home (to their 41 degree house) to retrieve their church clothes and car for tomorrow. Next Robby ran a few errands-more gas, return the redbox movies, buy propane for his grill and some groceries for tonight's supper-tacos. He picked us up and we all headed home. Before we could all unload, Dana, Cash and Lilly arrived to warm up and hang out. My kids were getting a bit wild this morning so things really got nuts when cousins arrived. We had tried to get ours to play outside when we came home but the thought of putting on coats and changing into play shoes was just too daunting for them so they headed upstairs to play. The kids played air hockey, watched a movie, played a few games, worked on a craft project, fought over the ipad while the adults read a few magazines, refereed the kids, watched some of the movie and enjoyed hot chocolate. When everyone was upstairs, which was most of the afternoon, there were 12 people up here. That being said, we managed pretty well. Around 5, we started cooking. Robby set up his camping table in the mud room so he could use his little camping grill there instead of in the kitchen. We set up a card table upstairs to help with the food setup. We actually never thought that we would be cooking in our mud room-this really is like camping out. Actually, Anderson must have smelled the food and opened the bonus room door to ask "are we barbequeing in the house?" We are pretty impressed with how adaptable the kids have been during all of this-sleep in a tent, stay in one room, wear your pajamas all day, keep the doors closed and the list goes on. But they handle it all in stride and even Campbell remembers (for the most part) where to put the flashlights and what to do with her bedding in the morning. Nonna, Pops and Jason were coming over for supper tonight but felt that they should cook up their food so they skipped out. Soon we got the call that their power was back on. Followed shortly by a call from Dana's neighbor saying her power was on. This led to us checking on Grannymom's answering maching and their power was on as well. Jason's power hasn't yet come on-by the entergy map, I am guessing his will tomorrow. Also by the entergy map, I think ours will be Monday or later. But who knows, it could be now...or now....or now. Supper was delicious-tacos and all of the fixings along with pecan pie and ice cream. I knew I had bought that pecan pie for a reason. Dana offered for Reagan and Campbell to come home with her and Lilly. So Cash stayed here with the boys. Campbell was so excited to get to go-except she was a bit worried about Wilson (the dog) biting her. She is a mess and a half. It was too daunting of a task to retrieve their church clothes and too much trouble to fetch them in the morning, so they are getting a pass on going to church tomorrow. The boys played pretty hard this evening. My boys did get into trouble at different times. Robby told them to go and sit on the steps. They both waltzed to the bonus room door, opened it and then turned around looking at us with huge eyes. Without lights, the house is dark and they were none too thrilled with having to sit out there in the dark. They didn't make it 30 seconds each before they were apologizing and asking to come back. The boys could have played for hours with blocks and their race cars. Robby and I were talking about how that is how we played-no electronic devices. Might just be my new years resolution to cut down on the kids device time-but that will not be until after we have power and after we have recovered from not having power! Keaton again missed her nap this morning and this afternoon so she was pretty clingy and fussy tonight. Poor thing, it is hard to put her down for a nap when we are two feet away from her pack n play. Though she is adjusting fairly well to all of this commotion. Robby and I were just talking about how we are not uncomfortable-warm room, cold food, comfy couch-but this is just a lot of work. But I think we will be bit disappointed (a fraction of a bit) when the power comes back on and we have to get back to our old routine. We all slept wonderfully and warmly last night in the bonus room. I even got hot in the middle of the night! I think I may grow up to be a generator spokesperson. Anderson was the first to crawl onto my side of the couch, followed by Graham and then Reagan. We were making enough noise that we woke Keaton up but she was just sitting happily in her bed waiting on us to get her. Actually, she was probably looking around wondering "what closet do they have me in tonight?" Pretty early this morning-well, I guess it was pretty early. I have lost all track of time without clocks around nor can I keep up with what day it is. Anyway, pretty early Robby set Anderson up with his race car video game downstairs and Robby grabbed our laundry and left the house. While he was gone, I put away a few Christmas presents, cleaned the fridge (an empty fridge is kind of yucky), put up some clean laundry that was hidden away in the dryers and tried to straighten up a few things. The kids had a blast playing on the race car game. Campbell even played and was patient with everyone else when they tried to tell her how to do it. Keaton spent most of her time climbing in and out of the black chair or crawling around behind it. I would run and do a few things then check on them and run back into the cold house. After a while I had had enough and was pretty chilly. The kids never seem to get cold-they were up in the toy room today playing despite the 48 temperature. I had planned on helping them clean it up but that wasn't happening. So I herded everyone upstairs to the bonus room oasis to play. First we played Minnie bingo, then we worked two of the boys puzzles, then 3 of Campbell's puzzles. And by then Robby made it back home. His first stop was to pick up Grannymom and Grandpa. He even said that he thought he could see his breath in their house. Then they headed across town to do some laundry. While Grannymom and Grandpa waited at the laundry may, Robby ran a few errands. He bought generator gas, looked for batteries (no Ds anywhere), looked for propane tanks (out of those too) but he did find some breakfast foods and Chinese food for lunch. So I would consider his trip a success-clean laundry and Chinese food. Grannymom and Grandpa were happy to be able to take their coats off in our house. After they unpacked and Robby worked on the generator some then it was time for lunch. Warm food just feels good when the house is coldish. When the kids finished eating, they finished watching Annie. Campbell really liked the movie and even asked to watch it again tonight. Then we spent the afternoon, working on Graham, Reagan and Campbell's sticker mosaics, playing cars and building roads with blocks, painting fingernails and taking baths. Actually those last two happened after everyone got bundled up to go outside. When we started getting bundled it wasn't raining but by the time we made it outside it was slightly misting. The kids didn't mind the mist and played pretty hard. Anderson was delighted to be able to ride his Santa present-scooter. Graham was just as pleased about riding his and they were both pretty good at it. Reagan has convinced herself that she can only ride hers in the kitchen and never touched hers today-though who could blame her since part of the driveway is still icy. Reagan did however, spend her time working on a snowman. I didn't wear my gloves so unfortunately I wasn't able to help (hate that, really hate that!-not really). Campbell, Keaton and Grannymom were the first ones to go inside-well, I was already in myself though. Before too long, everyone followed and the baths started. Campbell and Graham were first and then Keaton took Graham's spot. Next was Anderson followed by Reagan. Graham was so excited about opening up his new washcloth that expands in the bath tub today. And Campbell was not happy at all about Santa not giving her one-Santa tries to be equal about these things but when the dollar store only has boy ones then Santa has to put something else in the girls stockings. After baths, the kids played a few rounds of air hockey and ping pong and before too long, Grannymom had finished making chili and Nonna, Pops and Jason arrived for supper. Our power may be out but we are just having one big party here. Keaton is loving all of the attention that she is getting from everyone! After supper, Robby turned on a strange (yet kid friendly-ish) movie from redbox. Then he and I ran downstairs to work on some of the laundry and get our room ready for Grannymom and Grandpa. We changed our sheets to flannel sheets and Robby plugged up a heater to keep that area warm since it isn't part of the addition's heat. After Nonna, Pops and Jason left (all carrying their flashlights), Robby hooked up the hot water thing and I jumped in the shower. I love my shower-might have been the best 5 minutes of the day. Oh, who am I kidding, I was in there for a lot longer than 5 minutes. By the time I emerged, the movie was over and we stared bedding down the kids. The kids are getting to take turns sleeping under the table-tonight is Reagan's turn. This is big time stuff at our house-who is getting to sleep under the table tonight? Campbell and Anderson are next and I am hoping that neither get their turn! But we are pretty well set if it does take that long. It looks like our Dallas trip has been postponed. No worries on that though, hopefully we can all go the weekend after my birthday. By that time, all lights should be on and we will have had enough time to wrap up these generator cords and repack my fridge. Again tonight, the kids were all tired. This sitting around not really doing anything is pretty tiring for them and for us! We will all sleep well tonight. Well I said last night that our plans change and they did last night-for the better! We ended up not moving Keaton into our room because when I went to move her, she was snoring so loudly I heard her through the door. Then I cracked the door to check the temp in there and it was cozy, so I quickly shut the door and hightailed it back to my bed. The tent kids stirred around 4 and Robby climbed in with them for a bit. They all slept until 7 and then we all slowly started waking up. Robby finally woke Keaton up after 8 and we ran to the kitchen to grab some poptarts to eat for breakfast. I say ran because the 54 degrees that the house had gotten down to was quite chilly. As soon as the boys emerged from the tent this morning, they ran to our window to look out. They were so excited that it had snowed "again" last night. The first thing that Campbell did this morning was ask "we going to sleep in that tent again?" We told her that probably we would and she grunted at us. Seriously, though if you are cold in your house a tent is the way to go-it really heats up. You can even borrow 4 of my kids to help heat it up! Anderson desperately wanted to go outside today but Graham said he didn't want to go outside. Campbell looked at Graham and told him that she would stay in with him because it was too cold out there. Good thing we don't usually have cold weather or those two would never leave the house. Yesterday was more of a play day so we didn't really do anything except try to stay warm and maintain the house. But by this morning we had decided that no power is going to be a way of life for a few days (hopefully not though) so we started off working. We took down the rest of the Christmas decorations and stored them away in the attic. Leaving our lantern on inside the attic when we were finished. Our other lantern was left on last night by accident so we are lantern-less. Robby did look for batteries today at Walmart but apparently everyone in Little Rock also needs D batteries. No worries though, we have plenty of flashlights. I know I have said this before but not too long ago our power went out because of a wreck and we had no grown up flashlights. All we had were 3 kiddie flashlights that you had to crank to get them to work. All of ours were out of batteries or not working. (We are going to stock up on batteries and propane tanks after this is all over). But after getting so many flashlights for Christmas we are good to go this go around. The kids did really well playing in the toy room while we worked this morning. Seriously, they act like it isn't freezing everywhere except for my bedroom. Robby though worked up a sweat putting the Christmas stuff up in the attic. Next up, our plan was to go to Nonna's to take a warm shower there and for a change of scenery. But then we got a glorious phone call....FedEx. Yes, we had tracked Robby's generator from Nashville to Memphis to Little Rock and then wondered if they would even try to deliver it. We guessed they would just say the weather was too bad but when FedEx says "overnight" they mean it! They called to ask if we could meet the driver somewhere-of course, Robby would meet her anywhere she wanted whenever she wanted! So we all loaded up in the red van. We thought it might be a bit easier to drive if the roads were questionable. They were all fine though-some icy patches but most had dry ruts for the wheels and some areas were completely dry. I am sure that will be a different story in the morning though. At Nonna's house, Robby ran in to take a shower-a warm wonderful shower and then him, Jason and Pops headed off to meet the FedEx truck. They then went to Walmart to pick up a few things and then back to our house to play with the generator. Meanwhile, Nonna made the kids hot dogs and I had some veggie soup-best thing I had eaten in a few days. Then we all had showers-it didn't matter that they were in the dark it was just a warm shower. Of course, as soon as I got each kid out of the shower, I would have the run down the cold hallway to the fireplace to stand by it to put on their clothes. We even had time to play a game and soon the menfolk were back from the adventure. Robby was very pleased with his generator purchase and they didn't have any problem getting it started and figuring it out. We are powering the heat to our new addition (I don't understand all of this but apparently this heater has a plug (not hardwired) so it works-our other two do not so they can't be done). We are also running my outside fridge and deep freeze. And also powering a few lamps and the tv. Robby is actually downstairs right now (9:02 pm) taking a shower so he unplugged a few things to use the tankless hot water heater. Oh, and we did use the microwave to heat up our pizza supper tonight. After returning to Nonna's house, Robby had a quick bite to eat and then we loaded up to go home and get gas and pizza along the way. We sent the kids to the bonus room-they enjoyed the heat up there while Robby straightened the garage and generator stuff while I tried to pick up some of the house. Seriously, it will take me 2 days to clean up when we get the lights on. We had already unloaded the refrigerator part of our inside fridge so I worked on moving our frozen stuff to the now working freezer. I did realize how filthy my inside fridge is and will have to be cleaned-maybe tomorrow. And then I will also have to unload and repack my freezers after this is all over so I can know what all I have and don't have any longer. Come to think of it, I still have an ice chest sitting outside-it is fine but I can move it tomorrow. It was getting dark quick so Robby set up a few lamps and then we called to see if Nonna, Pops and Jason would want to venture back out for pizza. Of course they were here before we knew it-I think it was because we have a tv! Seriously, my kids were so excited to just sit and watch the news. We are so spoiled (and I like it!). We all ate the pizza and then played a bit on the game table. Then we turned on Annie and the kids and grown ups set spellbound watching it. Remember we haven't seen tv in 3 days now! And we aren't even big tv watchers around here. Eventually Pops and all headed home to get their fire going for the night and we watched a bit more of the movie. Then we laid out the kids mats and sleeping bags-far, far away from each other after 2 nights in the tent-and they went to sleep in a matter of minutes. And they are sleeping soundly. Keaton is in her new pack n play in the closet up here. Yes, she must have been an especially good girl this year because Santa bought her a pack n play for Christmas! Her friends will be so jealous-actually the one that she has been sleeping on has a big bump in the middle and now she is literally sleeping like a baby on the new one! Tomorrow Grannymom and Grandpa might come over to see us-we hear Grandpa is wearing his hat around his house-and there may even be a trip to the laundromat! Whoop whoop! It's the simple things! About the time that we decided to go to sleep, Keaton started coughing and crying so we vicks vapor rubbed her and worked on her nose for a bit. This meant that she was no longer her sweet self and was mad and ready to stay up so this is when Robby decided that he would join the other 4 in the cozy tent. They all slept wonderfully in the tent. Though Robby did say that there were kids everywhere-it did look like a war zone when Keaton and I joined them around 8:30. They were only beginning to stir so I guess they did sleep well. Keaton and I were up off and on throughout the night. She liked to sleep with me holding her so we did that often. We did wake up once in the middle of the night and then again at 7. Both times that child pointed to my bedroom door. I knew that she wanted milk and didn't want to fight it. So we ventured out of our cozy-ish bedroom to get her milk and look around outside. This morning when I looked, I was quite surprised that we didn't lose any big trees. We have lots of branches down and unfortunately this afternoon we could see that a few of our smaller trees will have to be cut down. Now I was wanting snow but not really the type of ice and snow that messes up my trees and makes my lights go out! The kids don't really seem to notice that my bedroom is the warmest place in the house and they are happy playing with their new toys in the bonus room (48 degrees in there) or in their toy room (54 degrees in there). They would go off and play and within a few minutes would be back to my bedroom. The sun was shining in the window and it was pretty nice in there. And it got better around lunch when Robby and Keaton woke up from their nap in the tent. Robby remembered that he had a camping stove and camping heater and pulled them out. That heater heated up my bedroom to 70 degrees and the stove warmed up our mac and cheese, chili and hot chocolate for lunch. We spent a lot of time this morning working on putting together lots of legos-Anderson was thrilled to put together his new lego rv set and I was thrilled that it killed quite a bit of the morning. This afternoon was spent mostly...well, I really don't know. We have opened up more presents, played with them, had a few snacks and then finally ventured outside. Not being able to warm up after going outside kind of concerned us but we had planned to sit in the van to warm up if we needed to but with Robby's camping heater it was fine. I wish that I would have timed how long it took us to get ready and to go outside-gathering clothes, putting on new clothes, putting on coats and those blasted gloves. At least 45 minutes but probably longer. When we finally made it outside, I was exhausted! Graham was the first one to figure out how to make a snowball and he threw them until his gloves were frozen. We moved sticks including one that got stuck on poor Keaton's wagon which moved her a good 4 feet before we realized it. The kids threw snowballs, made snow angels and tired themselves out. Anderson was the one that really tired himself out-he found Robby's snow shovel and went to town on shoveling the sidewalk. He asked Robby if he could have a dollar for working and soon everyone was working on clearing the sidewalk. It is nice now that they are so young that they forget about asking again for their money. Don't worry though, we will pay up. Before going in, we did walk to the other side of the yard to look at the street. Cars have been down it but still looks treacherous. And there is a line down crossing the street coming into our yard. Robby doesn't think it was a power line but we still didn't continue our walk down the street. After dragging Campbell that far from the house, she cried the whole way home. I think it is hard for me to walk in the deep snow but it is probably really hard for her since it comes over her knees in some places. Back in the house, everyone took of their shoes outside, wet clothes in the mud room (14 gloves and plus 20 socks (some were wearing multiple socks) are still laying in there) and then we hurried to my cozy bedroom to put pajamas back on. Robby even ventured to take a shower. Our old hot water heater is electric and the water was still a bit warm. Even though our new tankless water heater on the other side of the house is gas, it still has to be plugged in to work. After a few drinks of snow dew (mountain dew and snow) for everyone it was time for supper. We again had our pb and js-last night of those since I am out of bread unless I can quickly open the freezer to find my frozen sandwiches. Then we headed to the van to charge our phones and let the kids have their tv fix for the evening. It is incredible cozy in here-probably could last quite awhile on the full tank of gas we got yesterday. Only problem is running to and from it since the garage is open and it is chilly. The current plan is that the kids will still sleep in the tent and Keaton will start off in the closet nearest Robby's office. We have discovered that it is really comfortable in there-the door has been closed and it is an interior room. Then we will move her when we go to bed. But like always, I have no doubt that our plans will change. We have heard two estimates for when we will get our power-7 or 14 days. No worries though, I just need the roads to clear and Nonna or Grannymom to get their power back so I can do some laundry and drop the kids off to come home and clean. But Robby did order that generator today-he didn't get one as big as he wanted but said this could be our "starter" one. He even paid extra for it to be delivered tomorrow. We doubt that will happen but that would pretty much guarantee that the lights would come back on tomorrow! I have accomplished nothing from my list today, my house is a mess, all 7 of us have been in one room all day long and are now in van to warm up for a bit-and it has been one of the best days ever! It was well after 2 when Santa and his helper went to bed and thankfully everyone slept until 7:20 when Campbell called us. Robby told her that he would be up in a minute and seconds later, Anderson called. Campbell shouted back at him "I already called my Daddy." Robby and I scurried around downstairs getting everything ready-the tree, Keaton and ourselves- before going to get them. They were all still in bed but as soon as we opened the door, Anderson and Graham were out of bed in a flash. We made everyone go to the bathroom before coming downstairs and then it was a mad dash down the steps. Robby held them off at the bottom of the steps for a few seconds and I was scared that I would be trampled! They were all so excited with their gifts and dutifully took turns opening their presents (in no order) and watched what everyone else received. I know I say it every year but seriously, that was a lot of presents. I even cut out a few presents and plan to cut out a few more next year-or maybe not. They are only kids once! Oh yes, the big Santa present that took so long for Santa was a game table upstairs. It is a smaller version but has fooz ball, pool (hasn't been played yet-my kids with sticks is not a good idea), air hockey, table tennis and the exciting games of chess and backgammon. They were thrilled with this as well. It is so interesting to me what the kids really get excited about. I think Reagan's favorite gift of all is a brush that she has been using on her dolls hair. Anderson and Graham were really pretty thrilled with gloves from their stocking. Keaton loves her new baby doll-mainly because that is her only really present from today. And Campbell, well, my Campbell's favorite was the candy in her stocking. Before too long, Nonna, Pops, Jason, Grannymom and Grandpa all showed up for breakfast. I had cinnamon rolls (that never really rose but were still pretty yummy) and Reagan had used her new cupcake maker to make chocolate chip muffins for everyone to enjoy. Everyone pitched in and helped us take stuff out of the boxes and before too long, Reagan, Anderson and Graham were speeding through the kitchen. Reagan was probably the most thrilled with the scooter because she didn't think she could do one. The boys have so been yearning to ride outside but unfortunately the weather has not permitted us to do that. Keaton wanted to go home with Grannymom so as I was getting her clothes for her to take, Campbell informed everyone that she was going to get her clothes so she could go as well. After she came back down and I had her potty, Grannymom had already gone outside to load up Keaton. Poor Campbell started crying "they left me, they left me." She is such a drama queen-after I explained that they were just in the garage did she calm down. While I was getting ready, Robby worked on a few things from his stocking-mainly his lottery tickets. When he shouted that the had one 12 dollars, the kids came running. They wanted to know what he was doing and he explained that those were like baseball cards. Um, kind of! It was starting to drizzle when we loaded up for Christmas lunch at Dana's house. I put in everyone's heavy coats knowing that we wouldn't use them but had them just in case. The kids were happy to show off a few of their presents and see what Lilly and Cash had. We had a delicious lunch but mostly did quite a bit of staring out the window at the weather. Soon Dana's deck was covered and we could see the ice on the trees. So we gave everyone a 5 minute warning and then soon scurried out the door. I thought then that the kids would always remember the Christmas when we left Dana's house in a hurry-little did I know what was to come the rest of the day. On the drive home, we could tell that the trees out here were already starting to bend with the weight of the ice and Robby said "I should have bought a generator." Now, if I would have had dollar for each time he has said that (or thought that) today I would have had enough money for a generator. After getting home, the kids played for awhile and we tried to pick up some. But around 3:30 the inevitable happened-the lights went out. We had already been standing at the window watching the trees sway, chunks of ice fall down and small (so far) branches come falling down. The lights going out sent Robby and I in to high gear-we picked up what was left of the presents and put them in the bonus room where their other presents are displayed. Of course for us to do this quickly, we had to banish the kids to the toy room. They put on their feety pajamas and then played by the window with their new legos for awhile and then everything fell apart. As I tried to calm them down on the stairs, Anderson just started crying that he wanted to put together his new lego rv. Reagan asked why the lights had to go out. And Graham started sadly singing "we wish you a Merry Christmas." It was pretty pitiful as I tried to explain that we would be able to do more things tomorrow and the lights being off was just a minor set back to our wonderful Christmas. I then promised them that in just a few minutes we would all do something fun. It only took that long for Robby and I to finished cleaning and even managed to get the downstairs Christmas tree up. Keaton was so interested in what we were doing and was shocked when we would let her touch the tree without admonishing her-there were no ornaments after all. We finished that job by flashlight because soon it was dark outside. I seriously have never been so happy to get flashlights as a gift this Christmas. I made sandwiches for supper and then we worked on Graham's marble track for a bit. Next up was making s'mores on Christmas night. The kids really enjoyed this and when Robby told them that they were going to get to sleep in the tent they were beyond excited. As we were finishing with our s'mores, Campbell came to me and said that she had something on her finger. It was chocolate so I just licked it off. And as soon as I did that she said "maybe it was poo poo." I immediately checked her pants and then she said "maybe it was Keaton's poo poo." It was neither thank goodness. After the s'mores, we worked some more on Graham's marble track and then it was time to teeth brushing and prayers. Anderson said the sweetest prayer tonight "Happy birthday Jesus and thank you for dying on the cross." Keaton is wearing her feety pajamas and currently sleeping in the school room. When we go to bed, we are going to move her to our bedroom. Hopefully she will stay warm enough to stay awake all night. Otherwise, all 7 of us may end up in the 4 man tent. If the power doesn't come back on tomorrow, Robby might have to put up our large family tent for us to spend the day in. I guess this will go down as a white Christmas. The kids had asked and asked me if it would be a white Christmas and I kept telling them no. Unfortunately, they haven't been able to enjoy any of it and probably will not tomorrow either-too wet and too cold to play and not be able to come in and warm up. But either way, they will always remember this Christmas-presents, breakfast, hurrying home from Dana's house, no lights, s'mores and sleeping in a tent-what a wonderful day! This is truly the ornament that started it all-Philadelphia. We had gotten an ornament while on our Honeymoon but once we had the second one our little collection of over 170 travel ornaments began. We now do not even have room to put them on our tree (Tomorrow, I will be out looking for a bigger tree.) We first visited Philadelphia on our first wedding anniversary. Our plan was to pull out a state each year and that would be the state that we went to for our big trip that year and then after 50 years of marriage we would have been to them all. It actually only took us 8 years to make it to all 50 and now we are carting 5 (almost 6) kids around the country so they can complete their 50 states as well. We were so young when we were in Philadelphia-Robby couldn't even rent a car! We had to walk and walk and walk all over that town. We even thought that this was a long trip-2 nights! It was loads of fun and as we were headed to the airport, I stopped at a little shop and found this ornament (it was a Sunday so I was very fortunate to find anything). I actually couldn't believe it when I looked for this link and it worked so here is the link from our 2001 Philadelphia trip. Merry Christmas! The first thing that we did this morning was threaten to take away the kids presents. Ha! It was just that kind of morning. Soon though everyone was calm (us included) and we had breakfast. The kids worked on messing up the house while Robby and I worked on straightening the house. I had neglected to finish my grandparents gift and Robby needed to get a new bin for our Christmas tree so we went to Walmart. We figured that there wouldn't be too many people there on Christmas eve. Actually, we were surprised that the crowds were manageable. The kids stayed pretty close to us and even managed to earn a movie for the afternoon. Robby picked up lunch on the way home. After eating we pulled Santa and got caught up on all of our countdowns-verses, Snoopy, What God wants for Christmas, Santa and the one above Graham's bed-a total of 5-no wonder we could not keep up this year. Oh yes, my favorite part of this event was when Robby was reading a verse in the Bible about the wise men bring Jesus gold...and then suddenly he was interrupted by Anderson who added "and Frankensteins." Yes, the poor child thinks the wise men brought Frankensteins to baby Jesus. After lunch, Keaton had a nap and the others watched their movie while Robby and I worked on our Branson picture book. After finishing the book, Robby and I headed outside to cut his hair-doesn't everyone do that on Christmas eve? Campbell did manage to fall asleep right at the end of the movie. Everyone changed into their evening clothes and we headed off to church for the Christmas eve service. We started off with Keaton in church and she did last about 20 minutes which was more than we expected. But once she became too restless I hauled her little self off to class-but the way that she ran (yes, ran) into her class I think she was happier in there anyway. My favorite part of the service was the end when everyone sang Silent Night and we all lighted candles. Anderson and Graham had sat patiently through the entire service with their candles in their lap waiting for this to happen. Reagan was thrilled to not only know Silent Night but hold her own candle. I was with Campbell and we held her candle together until she decided that she could do it on her own. This was during the part that everyone raised their candles above their heads-she managed fine and I managed fine as well without have a nervous convulsion as my 3 year old waved a burning candle above my head and her head. We then loaded up and went to Nonna and Pops' house. Jason was working the second service and Pops had gone to fetch Beebee and Papaw for the evening. The kids did really well. Reagan diligently worked on moving every toy out of the way when Beebee and Papaw arrived. And Anderson, who was seated in his rocking chair, said "glad you could make it tonight" to both Beebee and Papaw. Nonna had a massive supper prepared. The kids did fairly well eating-Campbell was our ornery-est child tonight (not really unusual) but Beebee and Papaw enjoyed watching her so we let it slide. After supper it was dessert time and then presents-lots and lots and lots of presents. The kids all passed out presents-Reagan and Anderson reading many of the names. Keaton really wanted in on the action so she just picked up one of her presents and walked around the room handing it to people. We opened and opened and opened. The boys got alot of the same gifts-binoculars, pirate ships to build, tractors, bow and arrows and marshmallow guns (Reagan was given one as well). Those marshmallow guns were the hit-thank God no one aimed one at Papaw who was by then snoozing on the couch. Reagan was the most thrilled with the glasses for her American girl doll, Campbell was really happy to get a new blanket and shopping cart. My Keaton was just happy watching all of the commotion and playing baby with Campbell. She really loved pushing around her new stroller. Soon after presents we loaded up and it was a good thing we had the big van. We had to get home because Santa will come early in the morning (currently Santa is still working in his workshop). The kids all put on their pajamas and then we made reindeer food. I was scrambling for this and actually hoping no one would mention it. But alas it was brought up so our reindeer will be eating chocolate chips, sunflower seeds and sprinkles-next year I am going to buy a carrot. The kids put on milk and cookies for Santa and then headed to bed. As we were putting on the cookies, Robby told Campbell that they were for Santa. She said "he's coming here?" She really doesn't have a clue about Santa yet but she has kept asking about when she is going to get her baby doll. I think the kids went to bed fairly well. I didn't really hear them much on the monitor. Though when I was in the living room working I heard a kerplunk-Graham falling out of bed. I rushed up there so he wouldn't come downstairs to join our bed. He was still sound asleep and probably could have slept their all night long. As soon as they went to bed, Robby and I started working. We unloaded the van and I placed everything upstairs. I like to display all the presents before we find their permanent homes. My Reagan does the same thing. I had already wrapped most presents and laid everything under the tree. And Robby worked on a big gift-note to self, always charge the drill before Christmas eve. I know the kids will be up early in the morning (hopefully not too early). The grandparents are all coming over for breakfast (crossing my fingers that my cinnamon rolls are good-or at least edible) and then lunch at Aunt Dana's house. So far is has been a wonderful Christmas eve and now I am crossing my fingers for snow and for our lights to not go out. Our ornament of the Vatican reminds me of our entire Italy vacation. I never thought that I would see the Sistine Chapel and it was truly amazing. But I also enjoyed our short cut out of the Sistine Chapel a lot as well (Thanks Rick Steves) because it cut out quite a bit of wait time. I would highly recommend our entire Italy vacation to anyone! Here is the link to the recap of our trip. The other day, Graham came up to me and asked "why does Reagan have to be so bossy?" I tried my best to explain that Reagan was a girl and she was the oldest and she would probably just always be bossy. Reagan is my perfectionist and Graham is my thinker-he takes everything in and asks a zillion questions. I thought we were getting ready for church on time but we did take a few extra minutes to take a picture-the kids were all dressed in their Christmas clothes. Once we made it to church, we needed to hurry on to class because we were very tardy. After church, we had lunch at Nonna and Pops' house. The kids loved the fruit as always but Keaton's favorite was the tomatoes. After they played for awhile, we headed home to set up our blow up Santa and train. Unfortunately, we let the weekends get away from us so now the Santa blow up will only be with us for a few days before it is taken back to the shed. Reagan's question as we drove from the house this evening was "why is our Santa brown?" And yes, our Santa is brown. You often don't see brown Santas out this way so we are offering a bit of culture to our neighbors. This afternoon the little ones had a nap and the others watched a movie-Graham wearing his army outfit. Before too long it was time for us to load up and head to pick up Nonna, Pops and Jason. We all went to eat at Newks and then to the capitol to see the lights. The kids were so excited to see the lights and then to walk around the capitol. The boys were the most impressed with the lego displays. Anderson said that he wanted all of the legos that he saw. As we were looking at one of the statues in the capitol lawn, Graham asked if it was a statue of Jesus' family. After we bid farewell to Jesus' family, we picked up slushies for the kids on the way home. Once we made it home, we pulled our Santas down before heading to bed. This was our third late night for the kids and it didn't take too long for them to all fall asleep. They already have visions of sugar plums dancing in their heads. This ornament is from our first trip to Wisconsin in 2006. This is when Wisconsin was our 39th state to see. It was quite a trip and Reagan was our only child-don't really remember many times when Reagan was our only one on a trip! There isn't a daily link from our trip but here is the post summarizing it. I was a lot less wordy back then. Graham was up around 7 this morning and usually I would not be too pleased about that. But since this was birthday party morning, I was up fairly soon after he joined us. Well, fairly soon may not be too accurate. Everyone had leftover doughnuts as I put hundreds of M&Ms on Campbell's cake. The kids stayed nearby because whenever one of candies fell they were fair game. Nothing better than doughnuts and M&Ms for breakfast. We did a bit of cleaning and before too long it was time for everyone to get ready. Of course I had to hunt them down-they were outside supervising the hanging of the pinata and the squeegee-ing of the windows. I finally found everyone for them to get dressed and they watched a movie while waiting on Campbell's party to start. She kept asking "when is my party going to start?" Soon Pops and Nonna were here. I put Pops to work in the kitchen and Nonna was put to work fixing Campbell's hair for the second and third times of the mornings. At noon, everyone started arriving: Grannymom, Grandpa, Dana, Jason, Nonna, Pops, Les, Shelley, Josh, Zach, Mason and his family, Laynie and her family, Kennedy and her dad, and Aiden and his mom. Counting our family that is a grand total of 31-pretty big party for the weekend before Christmas. The first activity was eating-pbj and turkey and cheese sandwiches for the kids, pimento cheese, chicken salad or turkey and cheese croissants for the grown ups, grapes, cheese dip, bbq weenies, hummus and a cheese ball. Then the kids went outside for a bit of bowling followed by the traditional Dennie pinata. The little kids even got to grab some candy first and then the big kids all stormed in to get the rest. Then we went back inside for the kids to decorate Minnie Mouse shaped cookies. Next up was cake and then presents. Campbell was very good-thanked everyone as she opened her presents and was pleased with all of her gifts. The party was a success and by 3 the house was picked up and the kids were all resting (another success). After a short nap for the little two (Campbell and Keaton) and big two (Robby and me), it was time to change clothes and load up for Dennie Family Circle Christmas at Grannymom and Grandpa's house. We had already taken our presents over there but still had a load-including Robby's heater for their garage. The garage was emptied and the heater was plugged up. Before too long it was warm out there and we kicked the kids out into the garage. The enjoyed plenty of room to run around and we enjoyed the door that we could close on them and no longer hear them. We ate supper and then the kids convinced Grannymom that it was then time to open presents. It took well over an hour for everyone to open their presents and the kids all did really well waiting on their turn. Even Campbell and Graham sat quietly with their presents in their laps. I can already tell what the favorite presents are for everyone-Reagan-a note pad and clip board, Anderson-his stomp rocket, Graham-dress up clothes, Campbell-doll house stuff, Keaton-picnic basket, Robby-his hammock and mine was my painting from Dana. We all racked up though. Anderson and Reagan noticed that they didn't get many toys this year-growing up! After opening presents, the kids migrated to the garage where we opened up stuff for them to play with and the grown ups had dessert and watched some of the basketball game. Before too long, it was time to change my crew into their pajamas and us to head home. They went to bed at 11 last night and it was nearly 9 tonight. So I think that they were pretty tired-I didn't even hear a peep on the monitor (well, it was in the bedroom). It was a pretty perfect birthday and Christmas celebration. This ornament is from Sugarbush Farms in Vermont. I really, really enjoyed this little stop. It was a little farm but did have a spot for us to have a picnic and then we sampled some cheese and maple syrup. Afterwards, there were animals to pet (not usually my favorite thing to do) but the kids really enjoyed it. The only thing that this farm was lacking was apple cider (which I never was able to have while in Vermont). Here is a link to that day's post. Night Out at Garvan Gardens! The boys were the first ones downstairs but Campbell was hot on their heels. Even though we had told her that today would be her birthday, she really didn't remember. Robby told her and she just grinned from ear to ear. After a few minutes in our bed, it was time for everyone to get their clothes on because we had birthday doughnuts to go and eat. We were at Krispy Kreme by 8-pretty good for us. They all picked out their favorite doughnut. We put a candle on the top of Campbell's doughnut and sang Happy Birthday to her. That child was so happy, so happy in fact that we could probably just cancel her birthday and she would be content. Oh this was an interesting tidbit about our doughnut run: as we pulled into the parking lot, Reagan shouted "I forgot my shoes." Lately I have been asking everyone if they put on their "school" shoes or "church" shoes when I climb in the car. But I guess I should start asking if everyone has on "shoes." We do spend quite a bit of time in the garage without our shoes so I guess it is a bit natural to just climb on in the car without shoes. Actually, I have done it before but thankfully noticed when I put my foot on the brake pedal. We made it home and worked on school for a bit. The kids did really well during school today. Anderson was a bit distracted and Reagan did go blank on how to do half of her math but overall, it was still a good morning. After they finished school, we went upstairs to start picking up and then worked on downstairs. When the kids are willing to help, they really can get things done. I was spouting out jobs for everyone as fast as I could (dust this room, put this in the laundry basket, find this in the freezer....). Pretty much, we picked up/lightly cleaned the house in about an hour (except for the kitchen). This kids will do anything to get ready for a birthday party-good thing we have parties around here quite often! We then had lunch-at lunch Anderson said that he wasn't leaving the table until Nonna and Pops showed up with dessert. He eventually gave up on them but before long they did arrive with birthday cookies for Campbell. Pops played with the kids while I put Nonna to work on my kitchen. The kids spent time playing but also kept appearing back in the kitchen to grab some more cookies. After they left, I put the girls to bed and the others played on the ipad for a bit and then watched a movie. Meanwhile, I scurried around the house working on birthday party stuff some more. Before too long, Robby was home and it was time to start loading up for our night of lights. Not only was it the night of lights it was the night to test out our van-14 passengers. The kids were packed in the back of the van like sardines but no one seemed to mind. And let me tell you it was a grand time-movies, hot chocolate, snacks and lots of good conversation. We walked around Garvan Gardens for awhile. Reagan enjoyed being around Anna and they had a good time with each other. Anderson and Graham liked hanging with Brett and they spent most of their time trying to walk ahead of our group. Campbell really liked the lights and enjoyed having different people push her in the stroller. And Keaton was fine for the first few minutes in her stroller-she was stuffed in their with her big heavy coat on. She really liked it when we let her down to walk! Next up was supper at Newks. We pretty much filled the place with our van and the other one. Robby splurged and ordered the kids their own food. I don't know how much they really ate but we sure devoured our food. Back at home, everyone came in for a few minutes before heading home. It was after 10 and my kids were exhausted. It didn't take any time for them to conk out once their heads hit the pillows. We then scurried around to get a few last things ready before finding our seats on the couch before the big day tomorrow! In 2009, we toured the Titanic while we were in Branson. The museum was crowded but we still enjoyed it. The most memorable part of the whole thing was sticking our hands in water as cold as the ocean that the Titanic passengers felt when they were in it. Here is a link to our days visit to the Titanic. Graham joined us in bed around 3ish and I am sure that the wind had already picked up by then but you hear little in this house and we all slept wonderfully. Actually, we had no idea about how hard the wind was blowing until we started leaving this morning. No real limbs down (just the one that the delivery truck knocked down a few days ago) but the fire pit table cover was missing. Thankfully it had gotten stuck in some trees so it was recovered. Robby dropped Graham off at school this morning and the lights were off in his classroom so they had to go to another class. That didn't matter though since this was party day and he could hardly contain himself. I took everyone else to Grannymom and Grandpa's house. Reagan had spent the night at Kennedy's house. Campbell didn't really want to go shopping with me because she thought she was going to miss out on some fun. But once we made it to the store, she was the cutest thing-walking through Target with her puffy coat on. She talked and talked about everything we saw. Campbell talked so much that strangers were coming up to talk to us and wish us Merry Christmas. I had just grabbed a hand held basket to put our stuff in and Campbell did her best to carry it. After we spent our limit, she said "now, I have to get Anderson some more." She couldn't wait to get back to Grannymom's house and wrap that present up and to tell Anderson that she bought him a "boy baby doll." I then headed off to see my speech kiddo one last time before hanging up my speech bag for a while. Then it was time for Graham's Christmas party. He is always so excited to see me when I walk in. They were about to have cupcakes and then it was time for a few games. The last game was pass the bell until the music stops. When the music stopped you were able to go and get your two goodie bags. Poor Graham was near the last and he was so disappointed every time that he didn't get the bell. So funny. What wasn't funny was when they opened up their presents from Ms. Stacy. It was a book and Graham crossed his arms and said loudly (I thought) "I didn't want a book." I quickly spoke to him and soon he did tell Ms. Stacy thank you. After the party, he couldn't wait to get into the car because I told him he could have some of his candy. He carefully ate it and even saved some for his brother and sister. Graham even tried to save a few pieces for Reagan but had just finished it off when she returned. He apologized to her feeling bad but she reminded him that she didn't like M&Ms. Grannymom had pizza and cupcakes for Campbell's birthday celebration today. Campbell was so excited to blow out a candle. She has been asking about her birthday since Graham's birthday in July. Grannymom's lights were out so they spent quite a bit of their day at Rock Creek playing. And yes, I didn't send Keaton shoes this morning (forgot) and my friends at Rock Creek were worried that Grannymom had left them there. She covered for me though and took the blame at not having shoes on the baby-hey, she did have on socks! I had actually done so much party work this afternoon that when a friend stopped by to drop something off, Campbell saw her and shouted "someone is already here." She thought her party was going to be a in a few minutes. The kids had all just gotten out of their baths and showers. Then we had supper and followed it up with my favorite Christmas activity so far-watching Home Alone. Seriously, we had so much fun watching the kids watch the movie-Campbell was about to bite her fingernails off, Graham kept his head up against Robby and Anderson and Reagan were on the edge of their seats. A great way to end the evening! 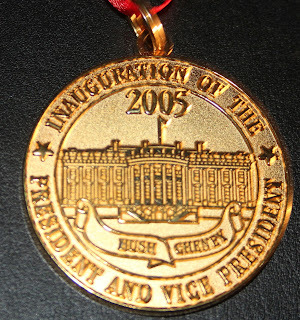 This ornament is from when our blogging history was sketchy-2005. 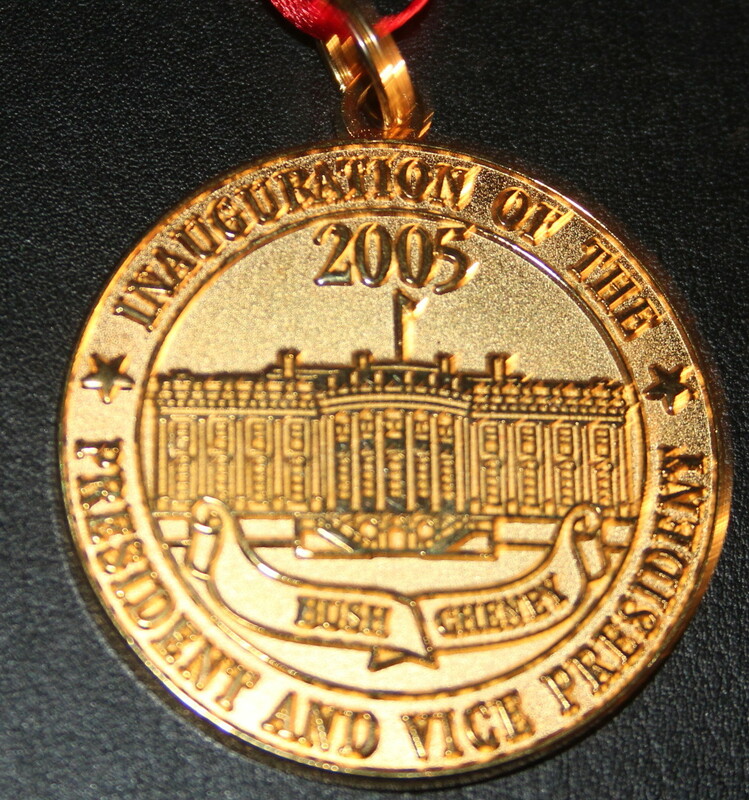 Our first reason for blogging didn't occur until September and this happened in January-Bush's Inauguration. Our D.C. trip was fun and cold and Inauguration day was probably the most frightened I had been in my life-protesters every where. We all survived and then rode the subway for a zillion miles to eat at a Melting Pot restaurant. Good times-now when we go to D.C. I am always happy when there are no (or even a few) protesters. Sorry no link from today! The morning started out well-everyone slept til almost 8 except Graham who quietly joined us in bed. And then I had my shower before Robby left and everything was going splendidly. And then it all just fell apart...completely fell apart. Graham realized that Robby had left without hugging him and started throwing his 30 minute fit. In Robby's defense, he did tell Graham bye but Graham was too interested in the game he was playing on my phone to look up. The fit lasted and lasted until his fit was overshadowed by Anderson's fit. I decided to make toast for breakfast and explained that toast is what we would have for breakfast. Could be toast with strawberry jelly, grape jelly, butter, peanut butter or even cheese but toast was all that would be served. Anderson was flabbergasted that there would be no poptarts at breakfast. Eventually he came around and decided that toast would be fine. So after I cleaned up the kitchen (already at my wits end), I rounded up the kids. They were all hiding in my room playing the ipad. I gave everyone another turn and then it was school time. But Graham didn't think his turn went on long enough and began his next fit. I sent him upstairs until he calmed-should have just made him stay in bed for the rest of the morning. We did school and things went fine until Graham did come back down. It was pretty crappy morning and I know this is the part in the blog where I say "oh, it wasn't that bad" but really today was indeed that bad. Bad enough that Reagan knew I could handle no more and even cleaned the school room while I was trying to calm/discipline Graham. Basically, his problem could be characterized by a lack of respect. When I say something his only answer should be "yes ma'am." Campbell is quickly picking up his bad habits. So something is going to change and change quickly. After school, we moved Keaton's clothes to my closet which makes so much more sense. Of course in a few months, her clothes will be shipped upstairs and the new baby's clothes will take her place. The kids put the laundry in the dryer and helped empty the trash cans in the house. By lunch things had calmed some and we all had lunch. Oh and yes, since we had eaten bread for breakfast and supper was going to be sandwiches, I made soup for lunch. My Graham decided that he didn't want the soup which was fine but that was all that was being served. Of course, when I pulled out the dessert for everyone that had eaten, Graham lost it again. He did sit and try to eat until he was pretty ugly with me and I took away his food (he wasn't going to eat it anyway). Before naps, Reagan put on a concert for me. She was the guitar girl and lead singer. And Reagan had set Campbell up as the drummer. I so wish I would have thought about video taping it. Campbell had boxes all around her and beat them every so slowly-almost to a beat with her lincoln log sticks. Keaton sat near me but would stand up to dance and sway to the music. And when I put the required rock star sunglasses on her, she grinned from ear to eat. I had kept Keaton up from her morning nap which really probably didn't help anyone's morning. But at 1, she was ready for bed and that was fine. I wanted to make sure that she was going to sleep this afternoon so we would all be ready for our afternoon. And I sure didn't want her to repeat her yesterday afternoon's screaming in lieu of nap bit. Campbell also had her a nap and slept. She has gotten really good about staying dry during the day. Enough so that I told Robby that soon we would only have one in diapers. Just for a few months though. The others watched a movie and this calmed my G-man down. After the movie he became his perfect, cute little self again. We went to see Beebee and Papaw this afternoon. The kids were fine and didn't knock anyone down-a win in my book. When we made it to church, Reagan noticed that a few people waved at us as we pulled in. Reagan said "in this car, everyone knows who we are." Ha, they sure do! My crew was all great in church-Reagan finished her review of her book, Anderson said a gob of verses, Graham was perfect each time I saw him in the hallway, Campbell made an ornament and Keaton loves Ms. Patricia. So it was a pretty good evening. Reagan spent the night at Kennedy's house tonight so she didn't ride home with us. She also missed out on some pretty good sugar cookies here at the house but I think she was going to get a milk shake on the way home. As we put the crew to bed, Campbell was the first Dennie kid not to get their nighttime star. Not real sure she understands the whole start concept but it will become clear on doughnut day. Of course Graham may not quite get it either because he asked if the kids that got all their stars were going to get doughnuts at the doughnut place-I guess he thought it wasn't "doughnuts with Dad" but "watch Dad eat doughnuts."